Grant Spotlight - Miller Elementary 4th Grade Current Events in the Classroom | Merrillville Education Foundation, Inc. 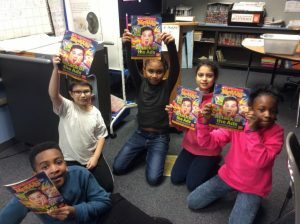 The fourth grade teachers at Miller requested funds to purchase materials to supplement English and Language Arts curriculum through educational, nonfiction magazines. Scholastic News is a nonfiction magazine designed to enhance language arts skills through current events. These magazines engage student learning through maps and charts, photographs, and fascinating captions with close reading questions and text marking activities. As a fourth-grade team, we use the Scholastic News as a part of our reading curriculum. Students and teachers can discuss current events, as well as practice reading strategies. Scholastic News provides online activities and additional materials, such as graphic organizers and paired texts with questions for extra reading practice. The students are excited when the new magazine arrives and enjoy the articles.